Ginger is one of those little miracle spices – a lot like turmeric in its ability to prevent diseases and promote overall health. The two ancient spices are highly revered and have been for thousands of years in Ayurvedic medicine (yoga’s sister science). If you don’t eat a lot of ginger in your diet at the moment, here are three reasons why you may wish to begin cooking with this wonder spice every day. This is a big one. We’re all deficient in certain micronutrients – think magnesium, zinc, and vitamin D. A micronutrient deficiency leads to many health problems, including diseases like cancer. Sometimes our bodies lack the ability to absorb these nutrients in an optimal way and need extra support – not from a pharmaceutical pill, but from another superfood. Ginger is that superfood. Not only does it nourish your body with its own nutrition, it also helps your body assimilate nutrients from other foods! At the root of all disease, whether chronic or acute, is inflammation. We want to cool the inflammation in our bodies wherever those trouble spots may be – and they can be anywhere. A lot of people experience inflammation in their joints, and suffer from sometimes debilitating joint pain caused by inflammation. Ginger is perfect for relieving this type of pain and you can even take a healing bath with the essential oil of ginger. Simply draw yourself a warm bath and place a few drops of organic ginger essential oil in the tub. This is an ideal nightly routine for the cold months that will soon be upon us. With the array of toxic foods lining the shelves of our supermarkets today, it’s no wonder so many people deal with issues concerning gut health. Sugar, conventional dairy, and gluten-laden grains are detrimental to the health of our tummy and we often feel bloating, gas, and general feelings of upset when we eat these foods. Not too mention the times of the month when women feel bloated and full of gas. 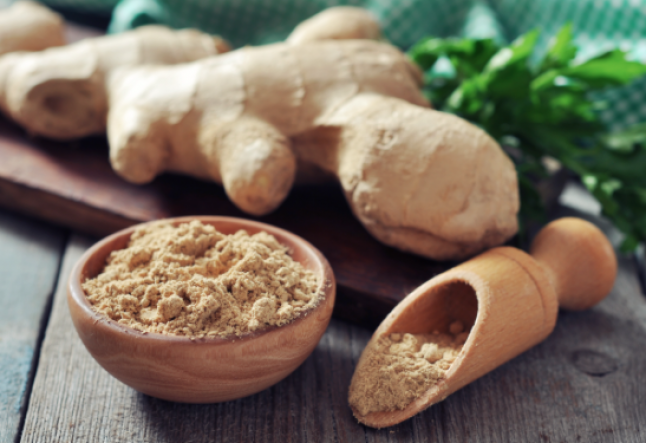 Ginger helps alleviate the bloat as well as an upset tummy. It reduces flatulence as well as the moans and groans of an unhappy stomach. I hope these tips encourage you to begin eating ginger on a regular basis! Your body, mind and spirit will love you for it!